Global sway imperfections: consider the global effect of columns verticality imperfections on the entire structure – available in Advance Design 2019 for one story buildings only. Local bow imperfections: consider the local effect of member imperfections on a single element, column and/or beam. 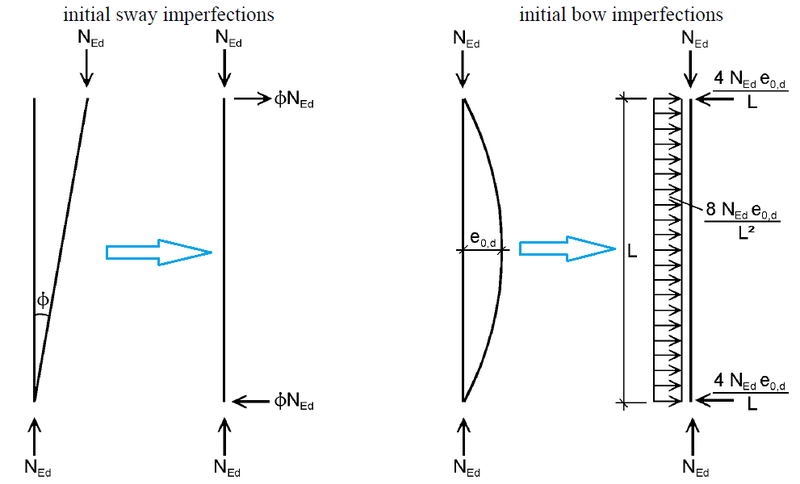 The equivalent static forces simulating the local bow imperfections on beams are computed similar to the column ones, based on the axial force, and affected by the coefficient k.
The equivalent horizontal forces applied to simulate the effects of imperfections are proportional to the compression force NEd. If NEd is a traction force for a given combination, then there are no local bow imperfections on this column for that combination. e0/L value are given in Table 5.1 of EC3, which depend on the buckling curve of the cross section, Table 6.2. National annexes may propose different approaches that are also included in Advance Design. Furthermore, the effects of the deformed geometry of the structure are considered by means of Non-linear analysis with large displacements (2nd order analysis). The user activates the direction of imperfection for global and local effects. Since the imperfections are generated in the local coordinates, all columns should have the local axes oriented similarly. The equivalent static forces act on one direction only in the case of local bow imperfections for beams: the weak one. However, the user has the liberty to set the desired imperfection axis direction. Also, he can set the k parameter for the equivalent forces computation. The general EC3 establish a value for k = 0.5. National annexes may propose different approaches that are also included in Advance Design. 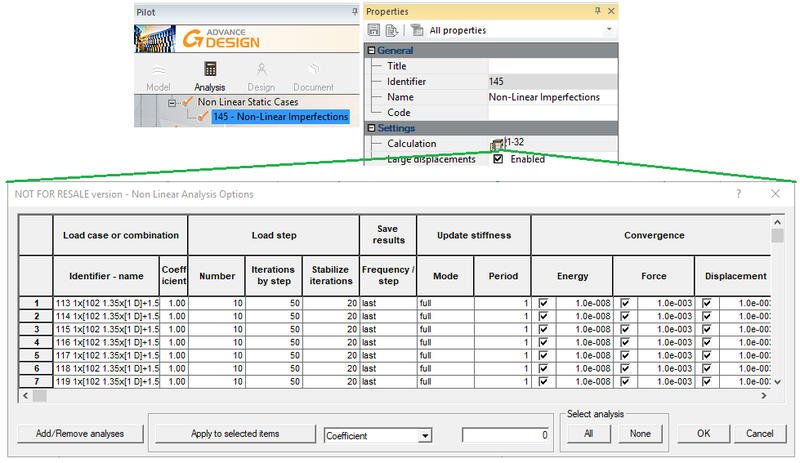 The properties list imperfections settings become active in the steel design only if the specific imperfection verification (global and/or local) is activated in the Calculation assumptions panel. The Non-linear analysis (2nd order effects) is also activated from this area. 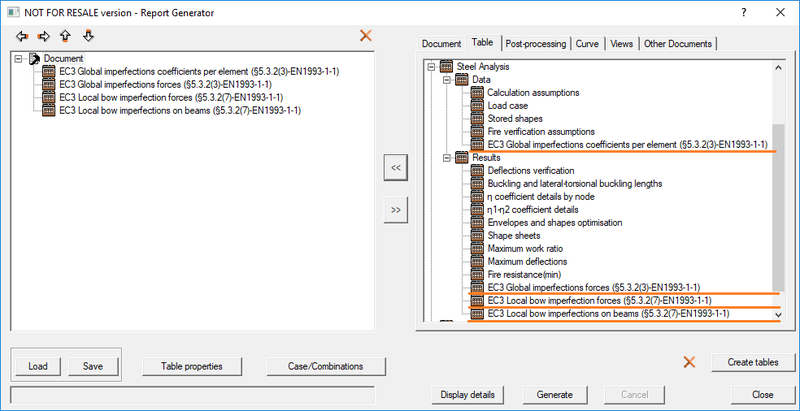 When considering imperfections and Non-linear analysis for steel design checks, the buckling lengths of the elements can be considered equal with the element lengths or may be neglected. In some cases, the user may be compelled to use another buckling length, the one already defined in the properties list. 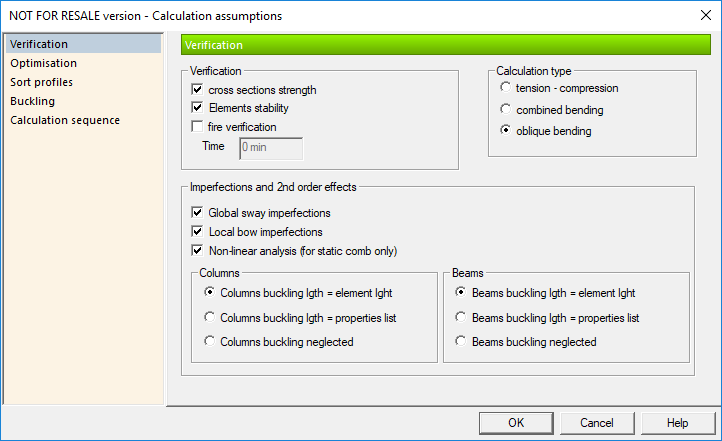 If the global sway and local bow imperfections are considered together with the Non-Linear analysis, the stability for buckling according to 6.3.1 is no longer necessary and not performed – the effects of imperfections are included. 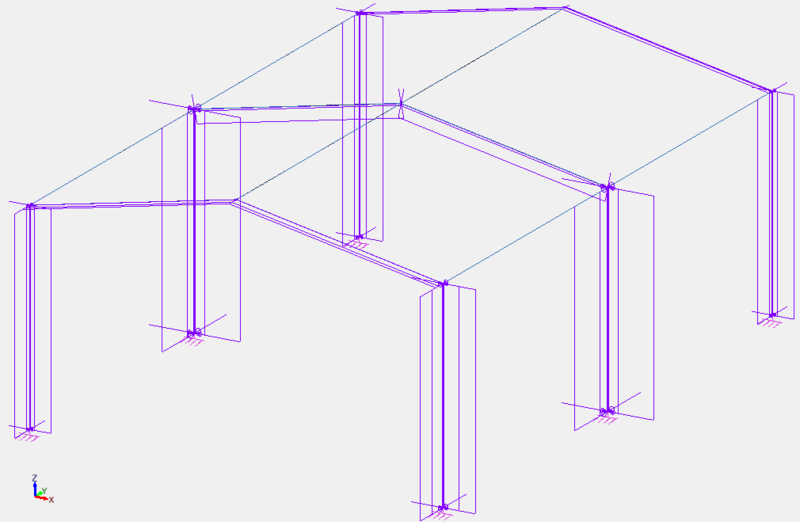 Before computing the equivalent imperfection forces, Advance Design performs the finite element computation and the steel design analysis in order to determine the most unfavorable cases for all the structural elements (columns and beams). The unfavorable cases underpin the computation of the imperfection forces (the axial force NEd used in the imperfection formulation is taken from here). 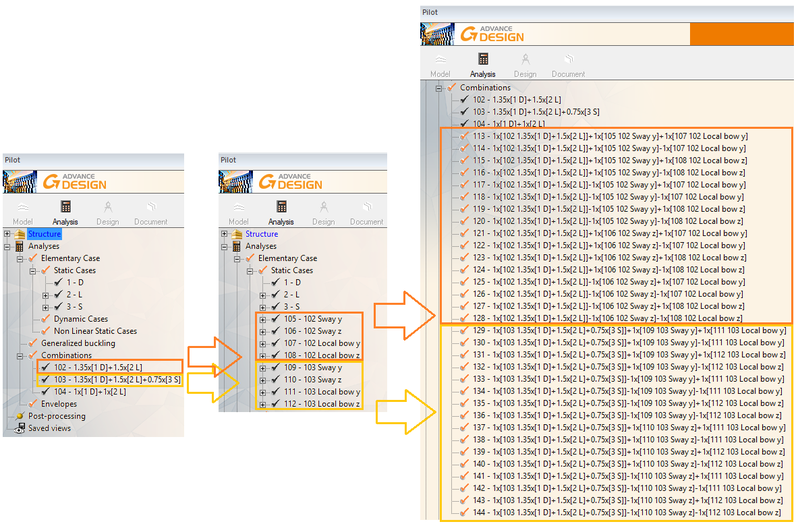 All the equivalents static forces generated to simulate the imperfections, for the critical cases only (in this example: cases 102 and 103), are grouped in static cases by type (global sway and local bow) and local direction (y or z). Besides the general combinations, amplified combinations will be created with the unfavorable cases (102 and 103) + or - the imperfection case, on each direction. 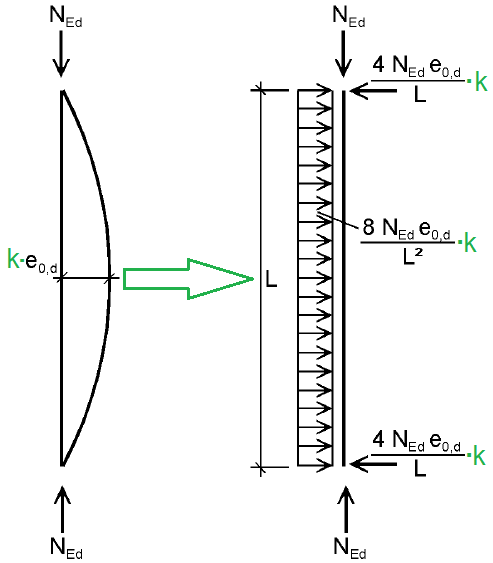 When the Non-linear analysis is considered, all the amplified combinations are included in the Non-Linear Static Cases with large displacement option activated. The imperfections static load cases (dictributed and concentrated forces generated on the linear elements with activated imperfection settings) may be observed on the model as in the picture below. The input data settings and the imperfection forces resulted in the process described so far may be generated in report tables.